In most cities of even modest size in the United States, you can find food from around the world: Mexico, Italy, Thailand, China, India. Depending on your geographic location within the U.S., you are also likely to find other less-commonly seen cuisines: Cuba, Ethiopa, Guatemala, Poland. But rare is the occassion when you come across a restaurant selling Indonesian food, which is a shame. Indonesian food is probably one of the world’s best-kept secrets. From the deceivingly simple nasi goreng [fried rice] to the savory, slow-cooked goodness of Beef Rendang, Indonesian food is full of flavor. Specific dishes vary from island to island, though staples such as white rice, fish, and peanut sauce are sure to be found across the country. And no matter where you are in Indonesia there is only one place that you should go to get a taste of the local flavor: the busiest warung you can find. 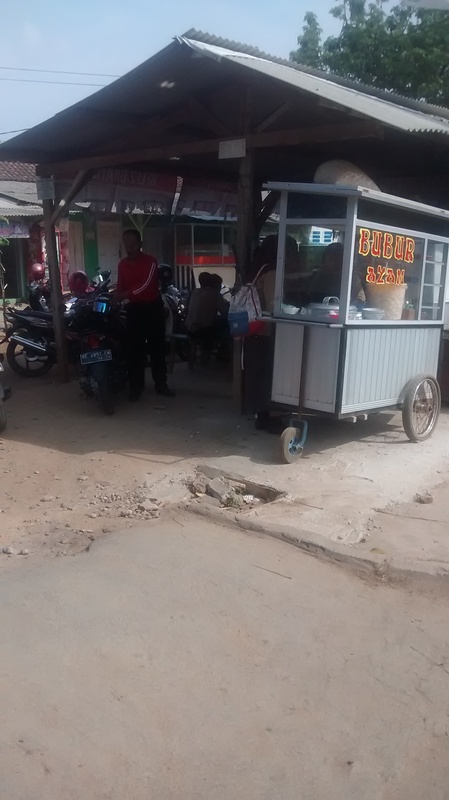 Warungs exist somewhere between the status of a street cart and a restaurant. Warungs don’t have an official address; they crop up on the sidewalk in a the shade of a tree one day and can remain there for years afterward. 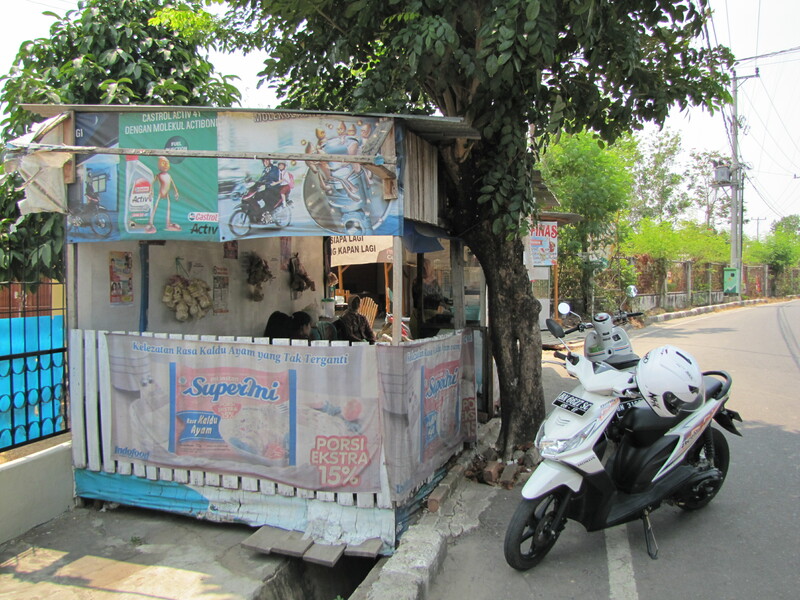 Typically, a warung becomes a semi-permanent structure that offers shade and seating for patrons and a compact food-prep area for the proprietor, who may or may not have a vending license. But as long as the food is good and the neighbors don’t complain, the small, family-owned business will continue to sell whatever their specialty happens to be. 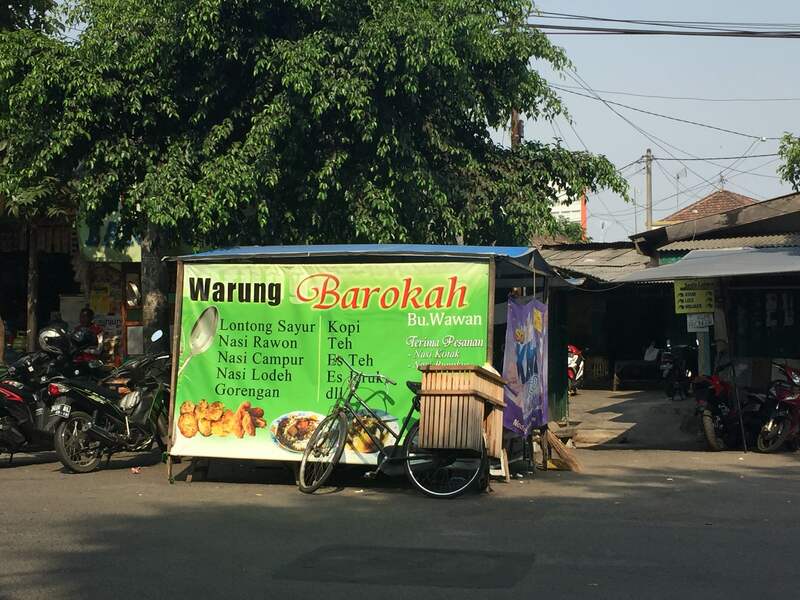 Recently Indonesiaful asked Fulbright English Teaching Assistants to share photos and brief descriptions of their favorite warung at their sites thus far. What follows are examples of warungs, a pillar of daily life in Indonesia and places where ETAs are able to deepen bonds with their communities. 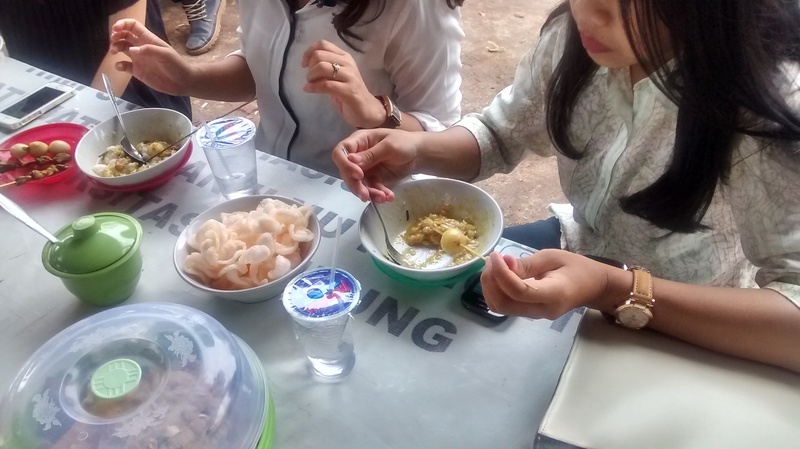 From ETA Rebecca Selin placed in Bandar Lampung, South Sumatra: My sitemate, Ramon Caleon, first introduced me to bubur ayam (chicken porridge) at a warung close to his home in the hilly ouskirts of Bandar Lampung. It transformed my outlook on Indonesian breakfasts. While I do enjoy breakfasting on spicy fish and boiled vegetables, bubur ayam reminded me of my favorite American breakfast: cheesy grits with hot sauce. Since I can’t make the hour-long angkot (public minibus) trek to Ramon’s neighborhood on a school morning, I started to look for bubur ayam closer to my kosan (dorm). Another factor keeping me from returning to Ramon’s bubur spot was that its owner wants to put my face on his sign with a slogan along the lines of “bule-approved!”. Thankfully, I am able to avoid becoming famous as Bandar Lampung’s porridge princess because I found an even more delicious bubur ayam stall along my walk to school. Pak Royanto, its owner, shows no interest in taking my picture. 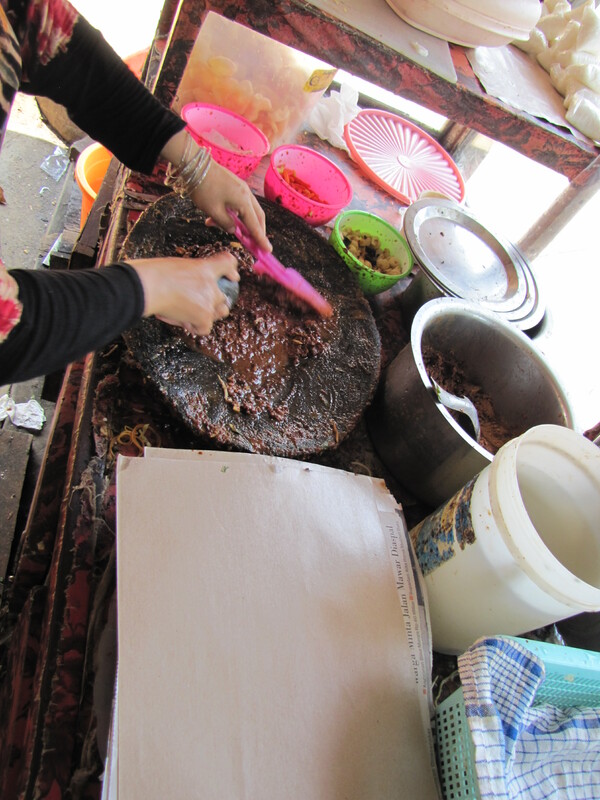 Pak Royanto serves up dozens upon dozens of bowls of piping-hot porridge six days a week. He and his nephew, Royan, run the roadside stall where I eat breakfast almost every day while school is in session. 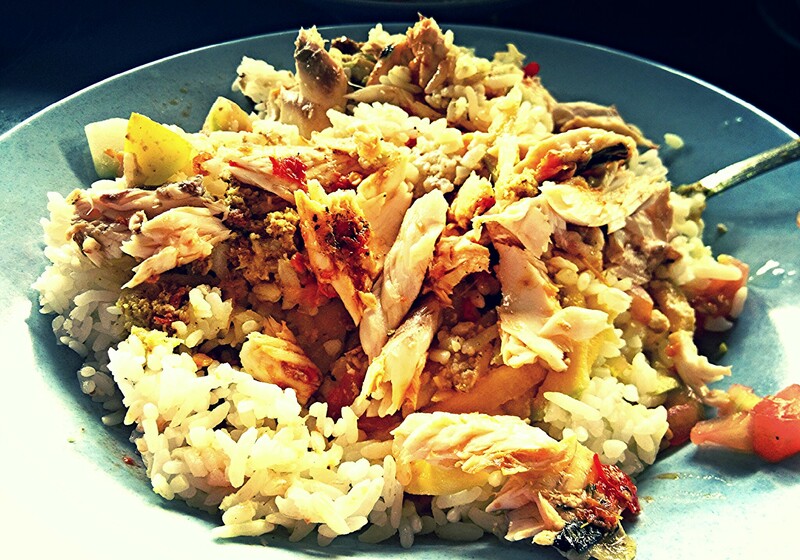 Their one-and-only menu item: bubur ayam (chicken porridge). According to Pak Royanto, his style of bubur ayam is a West Javanese specialty that is now popular across most of Indonesia. Pak Royanto makes the bubur by himself every morning, along with all its accompanying condiments. Every bowl of bubur ayam comes with a warm gravy-like sauce, keriupuk (chips), roasted peanuts, and green sambal as toppings. The bubur itself is rice cooked with excess water, parsley, spices, and shredded chicken. The sauce is made with coconut milk and chicken fat. Skewered hard-boiled quail eggs and chicken liver are served on the side. My favorite part of eating bubur ayam is the way the kerupuk melt into the porridge, contributing to its “cheesy grits” consistency. Usually, I am not very chatty when I stop by Pak Royanto’s stand. It is 7:00 in the morning, and I am in a hurry to get to school. They also run a brisk business, with their long picnic table full of diners, and a steady flow of takeout customers as well. I have now tried bubur ayam at several locations, and Pak Royanto’s is undoubtedly the best (although Ramon still stands by his mountain porridge). Even a fellow diner, an economics student at Universitas Lampung, agreed with me. He said that this bubur is “different” and “tastier than at other places”. I get very excited about bubur ayam. So do some of the university students who also frequent this warung. However, when I asked Pak Royanto about his favorite part of his job, he replied that it was “just work”. At least he acknowledges that he is good at his job, as he conceded that his own bubur was his favorite. He started this bubur ayam business in 2013, and judging by the constant stream of satisfied university students coming to eat Pak Royanto’s bubur ayam, it will be there as long as he wants it to be. I asked him if he had any funny stories from his time running the bubur ayam stall. He said “not yet”, but I think today’s interview may have provided him with his first. Pak Royanto’s bubur ayam warung. The tastiest bubur ayam in Bandar Lampung. Pak Royanto and his nephew Royan, the proprietors of this warung. 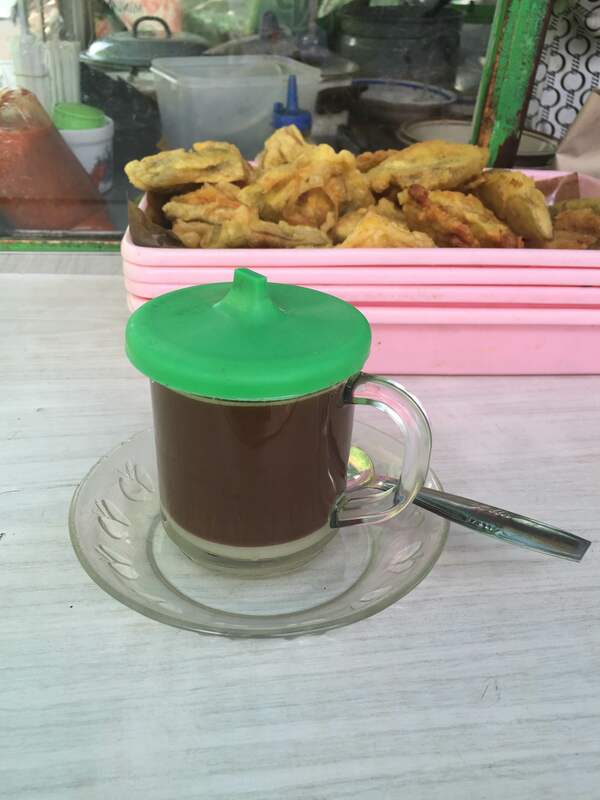 From ETA Bryan Howard placed in Wonosari, Central Java: Below is a photo of my favorite warung in Wonosari: Bu Sri’s Lotek. 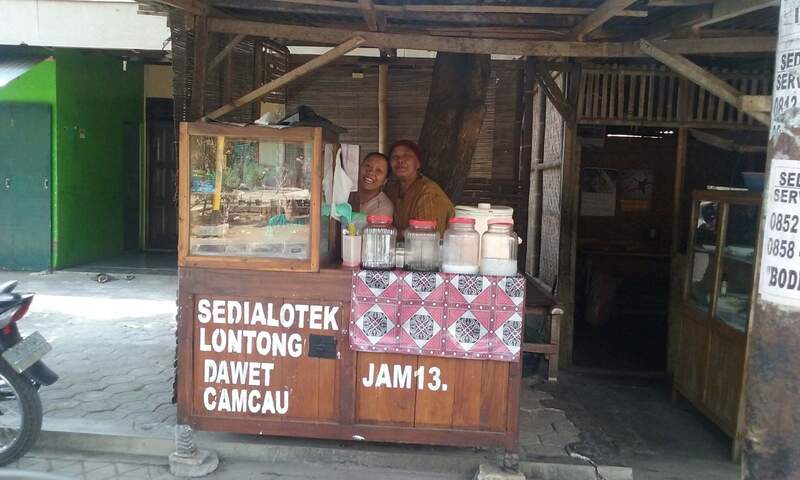 The warung serves lotek and dawet, a very sweet drink with coconut milk and leaf jelly. It comes complete with a tree growing through the middle of it and wonderfully friendly owners, and the food is delicious. From ETA Camille Ungco placed in Malang, East Java: Warung Barokah resides on Jalan Terusan Ijen in Bareng, Malang. Its location is conveniently placed at the intersection of multiple kampung kampung (neighborhoods) and Pasar Bareng (the traditional market of Bareng). Ibu Wawan and her husband opened their warung in 2006. Since then, the couple has been serving the residents of Bareng with their specialities: Nasi Rawon (rice with beef stew cooked with spices) and Kare Ayam (chicken cooked with spicy sauce). I live in Bareng, literally down the street from this warung, but I can’t claim the credit for discovering this spot on my own. My new friends from Malang introduced me to Ibu Wawan and her husband a few weeks ago and one friend regularly helps out at the warung. I usually stop by on Saturday afternoons for their Kopi Susu Jahe (coffee with milk and ginger – theirs is especially delicious! ), Tempe (fried soybean, a Malang speciality), and impromptu Bahasa Jawa language lessons with the couple, my friends and any customers currently enjoying their Nasi Rawon. 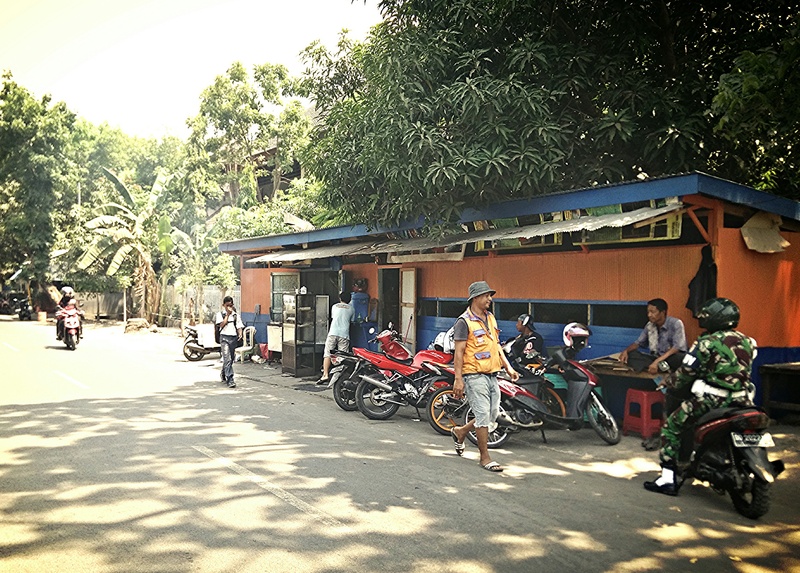 Street view of Ikan Bakar Batu Putih. The finger-licking-good fare served as Ikan Bakar Batu Putih. 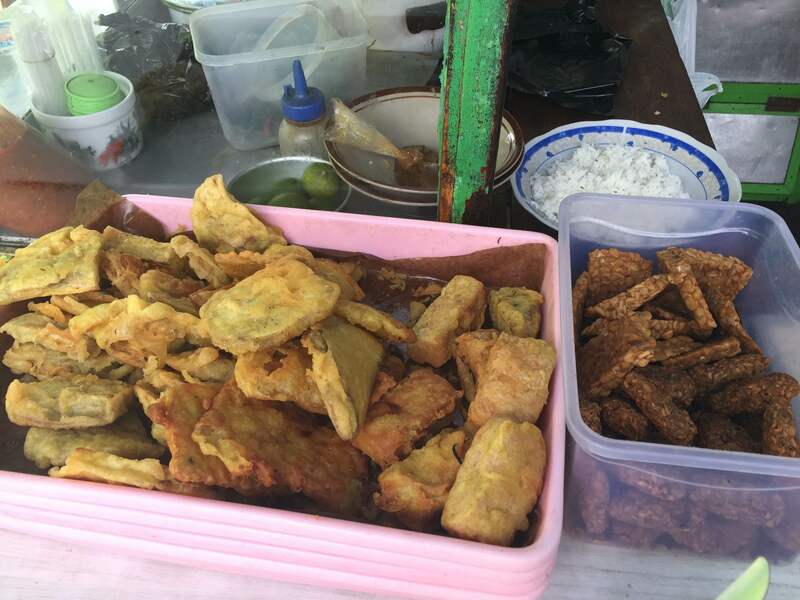 From ETA Kelly Fitzgerald placed in Pangkal Pinang, Bangka: Pecel Ibu Zura is THE place to go for pecel (a dish similar to gado-gado) in Pangkal Pinang. Ibu Zura offers on-site dining but most people, myself included, get pecel to-go. My counterpart introduced me to Ibu Zura’s on our way home from school several months ago and I have been there almost daily ever since. Her warung is open for lunch Monday to Saturday; around noon each day the wait time can be up to 15 minutes for a single serving to-go. On a recent visit, I was able to ask Ibu Zura more about her business in between orders. 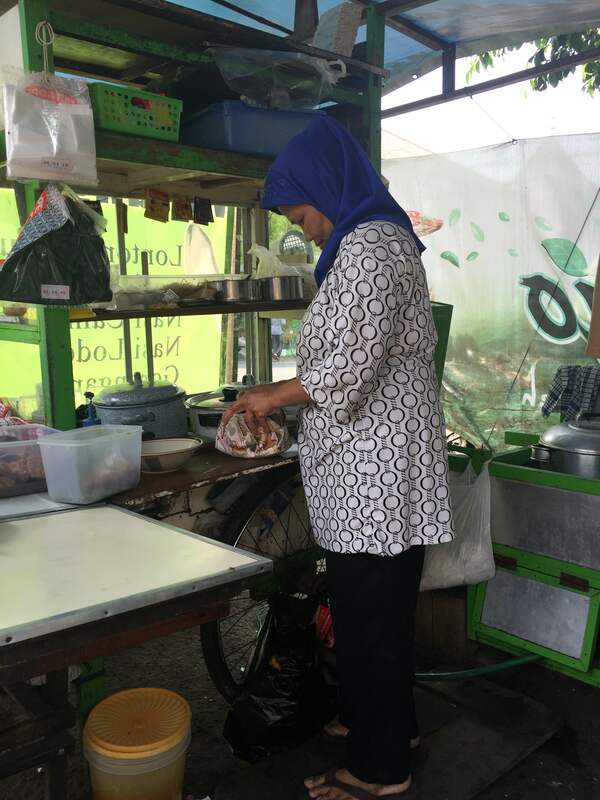 She has been selling pecel for over 15 years, though she has been at this location for just six of those years. While she is busy mixing up her magic, patrons chat about recent events and browse fliers tacked to the walls that advertise everything from English lessons to homes for sale. As soon as one motorbike drives away, neatly wrapped bundle of vegetable-peanut sauce-noodle goodness in tow, another one pulls up. Business is brisk and I am happy to have become one of her regulars so early in my time here. Pecel Ibu Zura is across the street from a local university and sits in the shade of a tree at a three-way intersection. Ibu Zura mixing up some magic.